Cucumber Melon Salad with Boncconcini – This one is made in about 10 minutes so it makes for an easy and delicious salad to take to a backyard bbq this summer. Mother’s Day Brunch Recipes – This is a round up of over 20 brunch recipes, perfect for any special weekend brunch, really! Black Bean and Tofu Scramble Lettuce Wraps – These vegan and gluten free lettuce wraps can be on the table in under 15 minutes. Leftovers are awesome as a nacho topping too! Chicken and Cheese Quesadillas – These cheesy quesadillas are a favourite in our home so they are on a regular rotation. Love the adobo sauce for a lil’ smoky heat, but you can use bbq sauce if you prefer. I am Pretty with Amy Schumer – I went to see this movie with my sister-in-law for a fun little girl’s night out. There were definitely some laugh out loud parts. At times, you may have gotten a little annoyed with the main character, but all in all, great movie a positive message. Master Chef – home cooks compete to win the title of ‘Master Chef’ and a large cash prize. I have watched this series from day 1 and am always entertained by it. It’s fun watching the contestants grow and make guesses on who’s gonna win. Love Connection season 2 featuring host Andy Cohen – ok, this is a ‘turn-your-mind-off-munch-on-some-popcorn-and-drink-a-glass-of-vino’ type of show. Highly entertaining, despite the fact that contestants who end up together don’t usually stay together. Woomp woomp. The Unbreakable Kimmy Schmidt on Netflix – the main character is a little over-the-top optimistic, but that never hurt anyone. It’s a great feel-good show and will definitely put a smile on your face. Dealpool 2 staring Ryan Reynolds. He was seriously made for that role. This one is jam packed with action and funny to boot. If you are a fan of the first one, this one will not disappoint! I See You novel by Claire Mackintosh – this is a little bit of a thriller novel and once I got started I couldn’t put it down. I actually think it would make for a good movie too. Definitely recommended! Not a Love Song by bülow – totally digging the hook to this one – really catchy! Zombie by Bad Wolves – a remake of the song of the same name by the Cranberries. Awesome cover. In my Blood by Shawn Mendes – a good listening/chill song with a little beat. As always, love to hear what you’ve been listening to lately – tell me in the comments below! This test from Buzz Feed Food was kinda fun (“Are you a Canadian Food Expert”). I scored 6 out of 7…not too shabby. How did you do? What’s your favourite Canadian food? Speaking of which, I love ketchup flavoured chips. Don’t knock it ’til you try it. Those are delicious! My brother and sis in law gave me a bag of Hungry Buddha Classic Coconut Chips and, let me tell you, they are ADDICTIVE!! SO SO good. I need to grab more….btw, this is not sponsored or anything, I just love this product. Real good snackin’. I came across the cutest shoes! Wedges with a bow-tie! Totally have to get these for the warmer months ahead. Hope you’ve enjoyed my monthly round up and favourites for May 2018! Tell me, what’s some favourites of yours this past month? You’ve seen some awesome movies lately Dawn! Solo and Deadpool 2 are definitely on our list to see! You’ve also had a pretty tasty month. Looking forward to seeing what you’re cooking up in June! 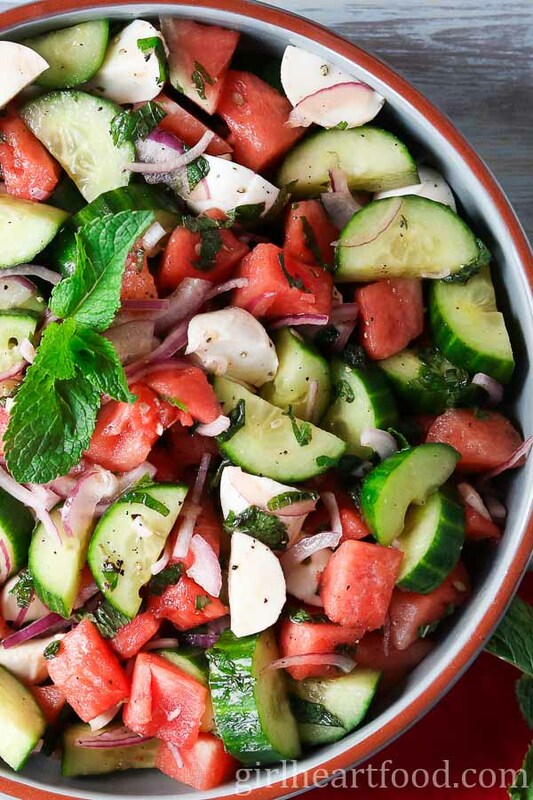 That Cucumber Melon Salad with Boncconcini is so so good, Dawn! Perfect paired with that sandwich I just commented on! Also -Deadpool 2!!! Gosh- thats on my list as I LOVED the first one! Thank you Shashi!! If you loved the first movie, you’ll really love the second one 🙂 Let me know if you see it! Didn’t I just see a mortadella sandwich post!? I think I must be going crazy…it looked amazing. But in the meantime, I do love your monthly roundups. Laura and I just saw some ketchup chips in the store the other day. She said, “yuck” but I told her she needed to try ’em. Some of the curling guys bring chips back whenever they go to Canada, so I know about the wonders of ketchup chips. Speaking of chips, they’ve (Lays I think?) started selling All Dressed here in the States. We did a side-by-side comparison with a bag of Lays Canada and Lays US. Not the same at all! Canada won the taste test by a landslide. Why is there a difference!? Either way, happy June my friend! May certainly went by in a flash, I’ll enjoy seeing what you will be sharing this June. It sure did! Thanks Karen 🙂 Happy Monday! As you know, I love your round ups! So many gems here…I’ve got those quesadillas on our menu this week. Those cheesy quesadillas look delicious! And can you believe we’re halfway into 2018? What what. 3 movies eh? I only just saw Black Panther and On Demand at that LOL! Now we can go see The Avengers if it’s still in theatres (or maybe wait for it on demand too haha). Hope weather gets better over there! We’ve been under heat warnings over here (and I am not complaining, not one bit). Happy weekend! Those quesadillas have me drooling every time I see them. That cheese!! I have yet to see Deadpool 2 but I love Ryan Reynolds so I can’t wait. Great roundup my friend!! I hope June has more sunshine for you! I love your monthly round ups Dawn! I’ll be making that cucumber melon salad shortly! Yay! Hope you enjoy it 🙂 Thanks Mary Ann! I still cannot get over the tofu lettuce wraps! So vibrant and so good for you. Yes to summer and more food fun. PS. The shoes look awesome. I wish I could wear something like that with grace. Sadly…oh well. Flip flops for me. They sure are! Haha – flip flops aren’t bad either 😉 Thanks Milena! First of all, THOSE SHOES! I’m a shoe-aholic and a gingham fanatic so I pretty much need those shoes like I need oxygen. Second, I took the Canadian foodie quiz because I’m also a BuzzFeed quiz fanatic and scored 2 out of 7. Haha! I shouldn’t be surprised :). I can’t believe it’s almost June! Time flies so fast it’s scary. Have a great weekend!